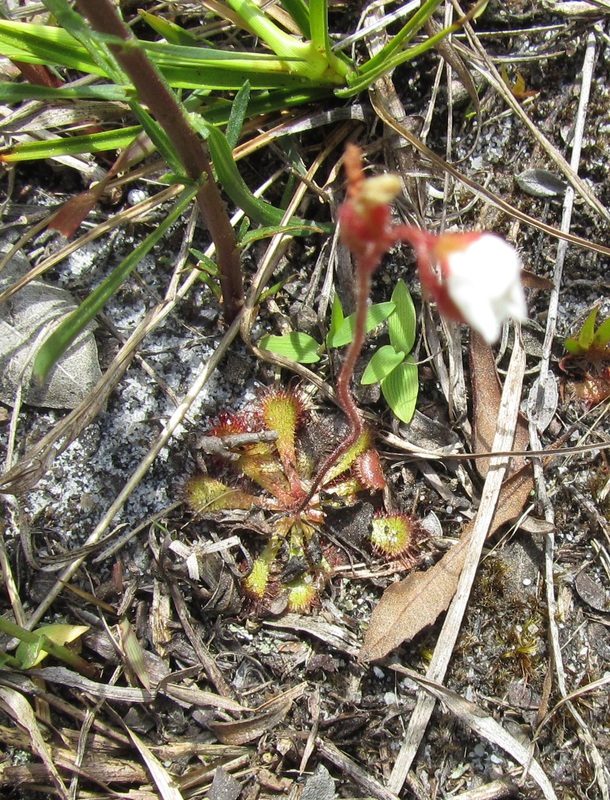 Common in our area, Dwarf Sundew is hard to find because of its tiny size. 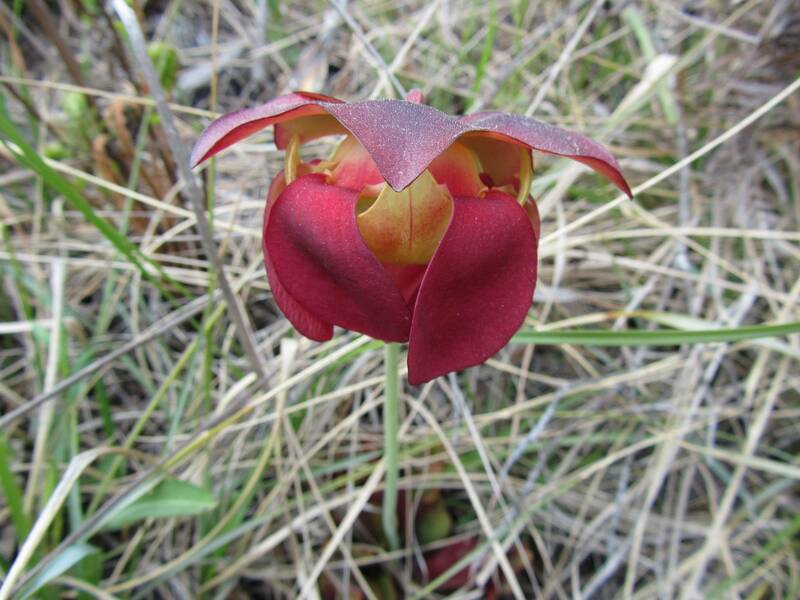 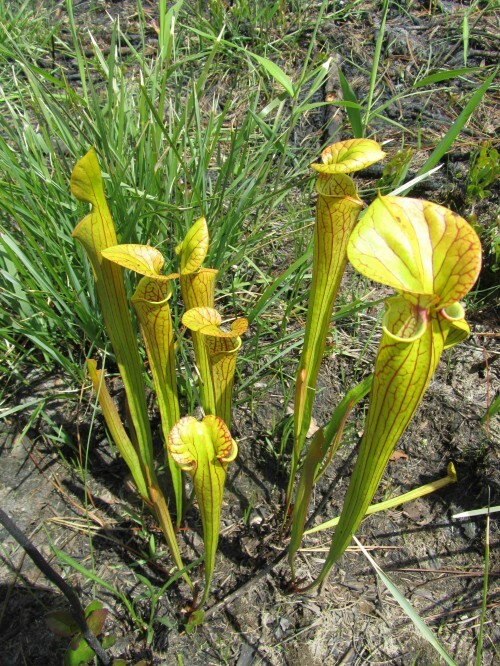 Sundews are insectivorous plants, catching insects on the sticky "dew" drops they secrete. 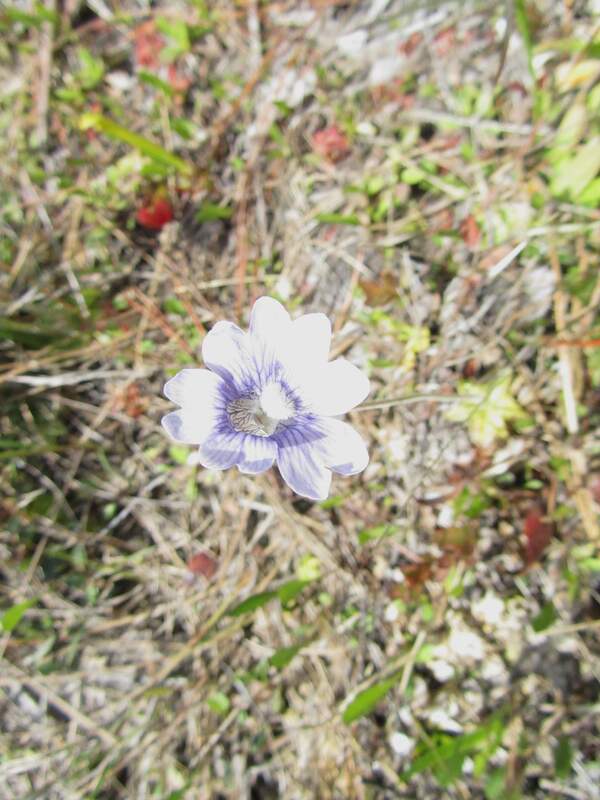 This one is just opening a flower. 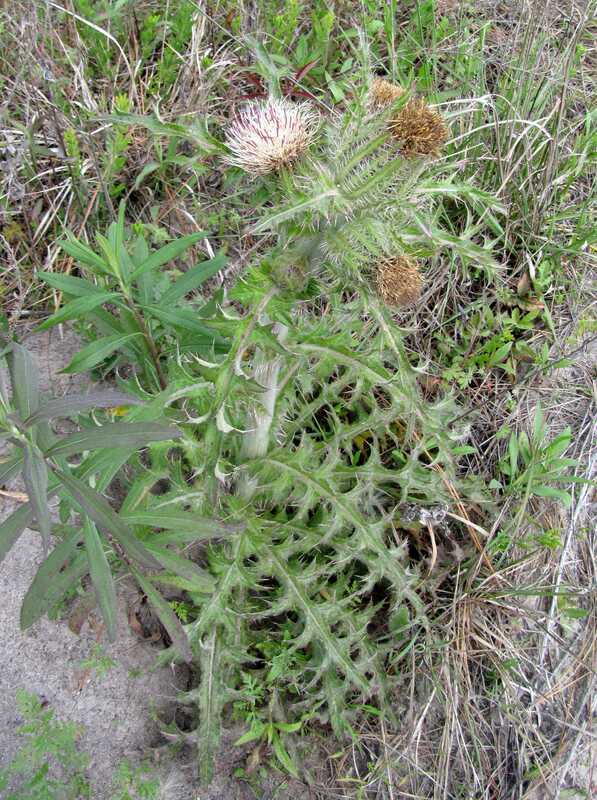 Identified by its small size, spatulate leaves and flowering stem with glandular hairs (stipitate-glandular inflorescence). 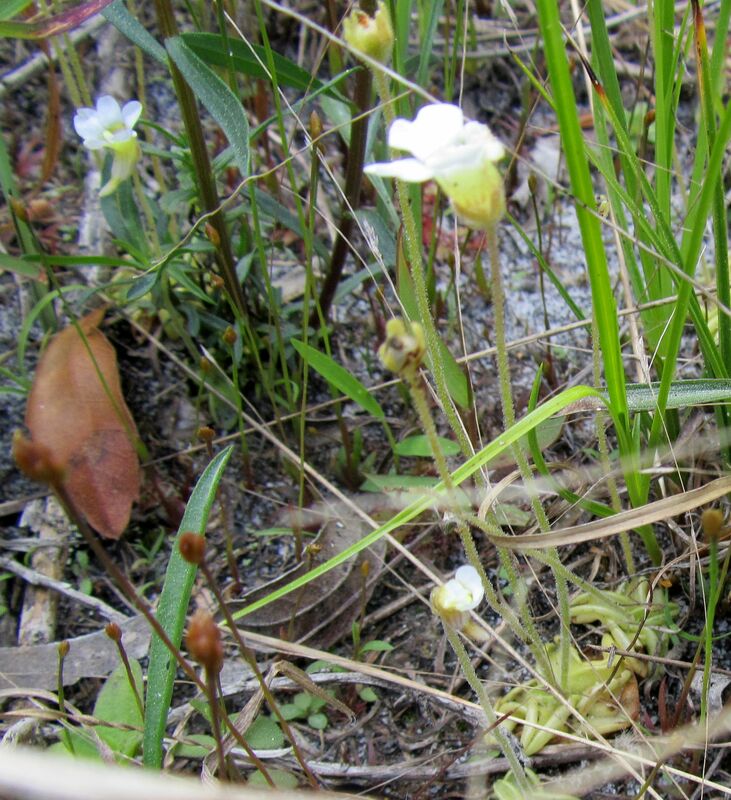 Also under the powerline were Small Butterworts, rare in our area and in bloom! 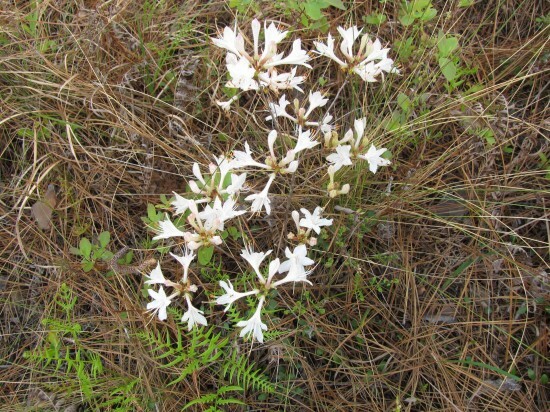 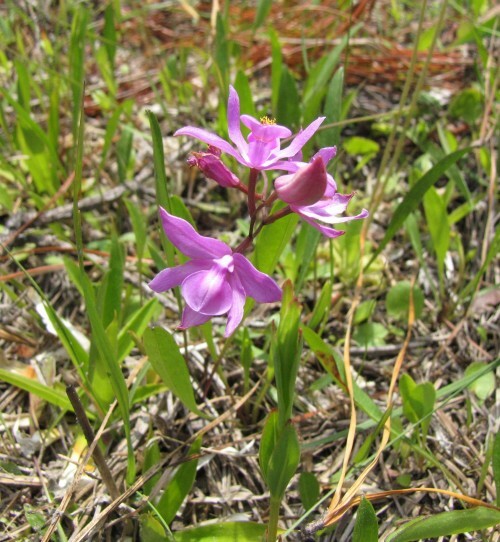 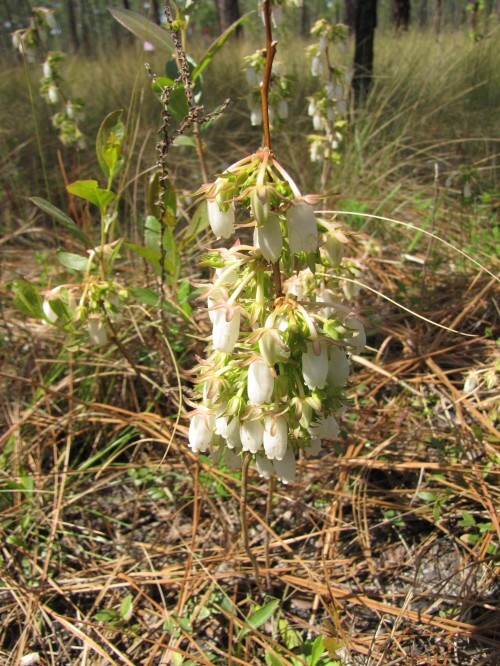 Good id marks are its small size and light-colored flowers. 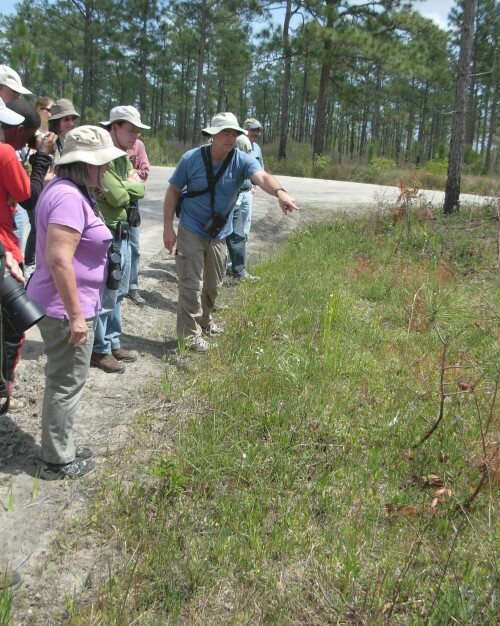 Jeff points out Calopogon barbatus and Pinguicula caerulea among the Pitcherplants. 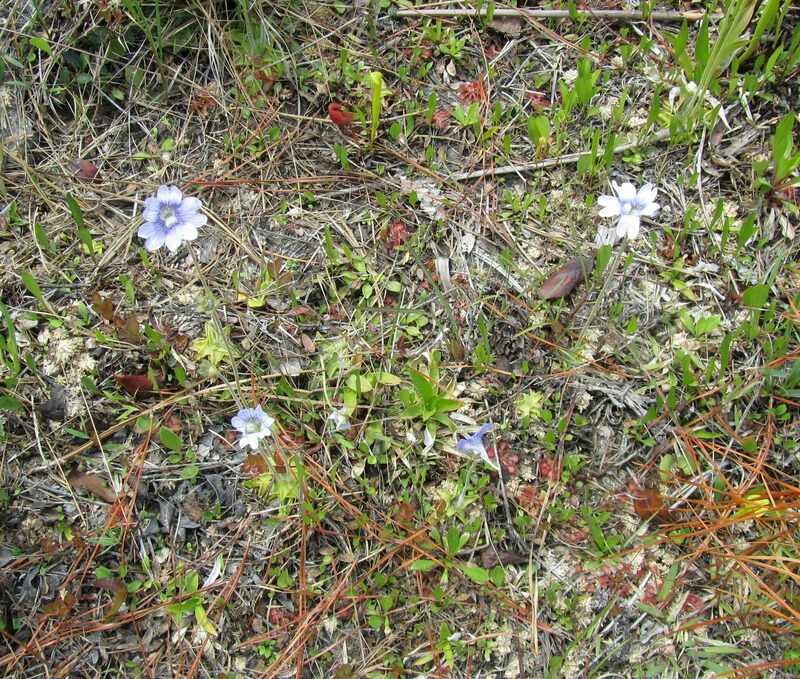 Uncommon on the coast, Blue Butterwort is larger than Small Butterwort and has larger, bluer flowers, although the flowers many rarely be white. 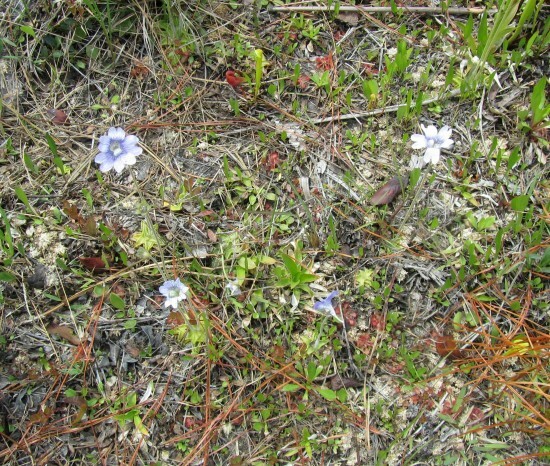 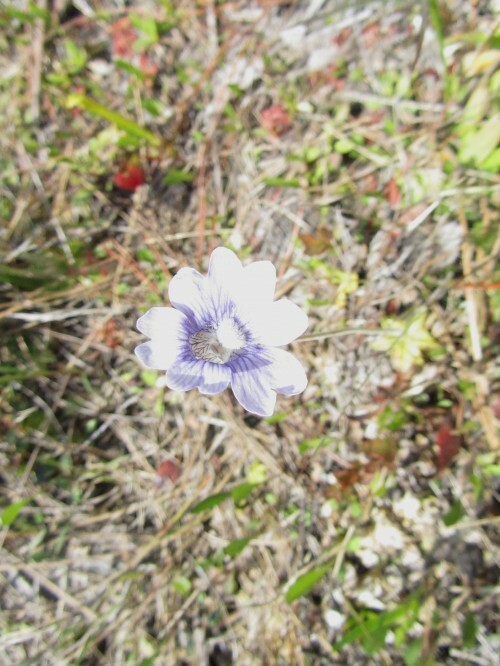 The tuft of hair protruding from the Blue Butterwort's flower is also a way to separate the two species. 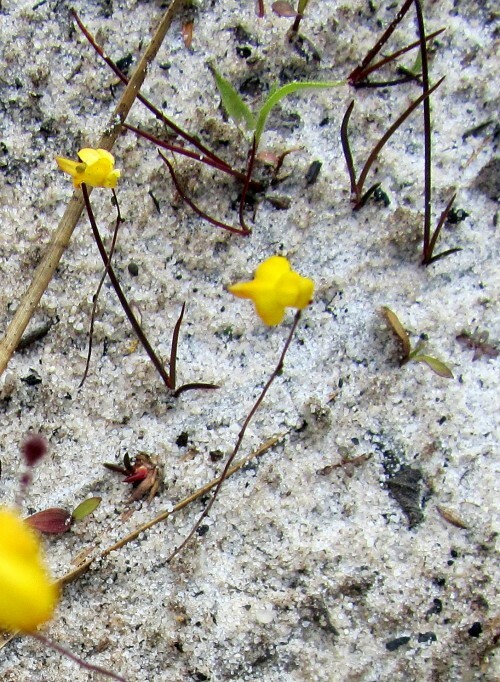 Here you can see the tuft of hairs (the "palate") protruding from the flower. In Dwarf Butterwort, the yellow, hairy palate is recessed within the flower tube. It's a treat to see this rare species in bloom! 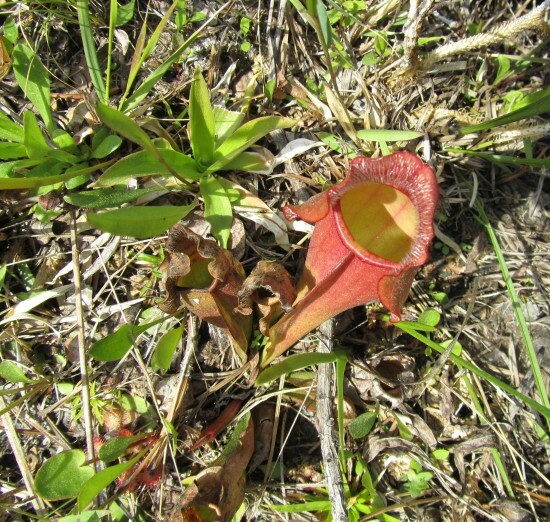 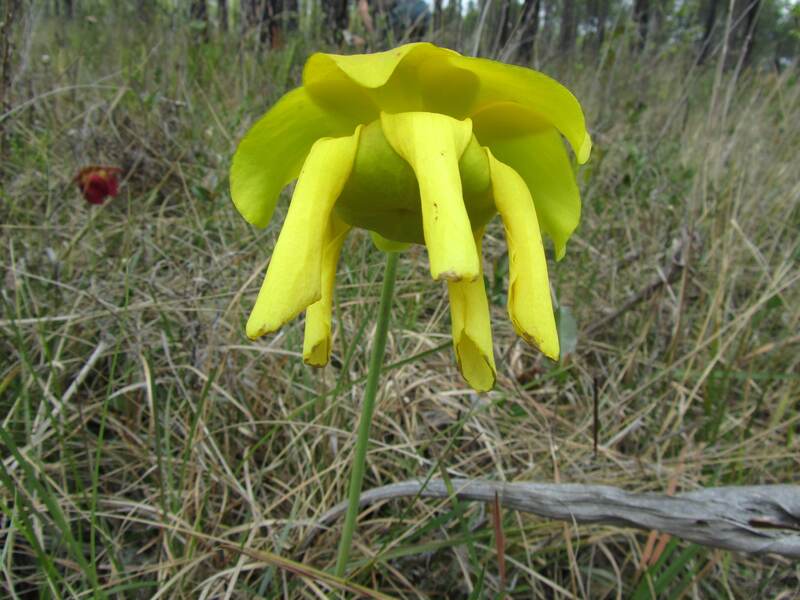 This common species has short, wide trumpets. 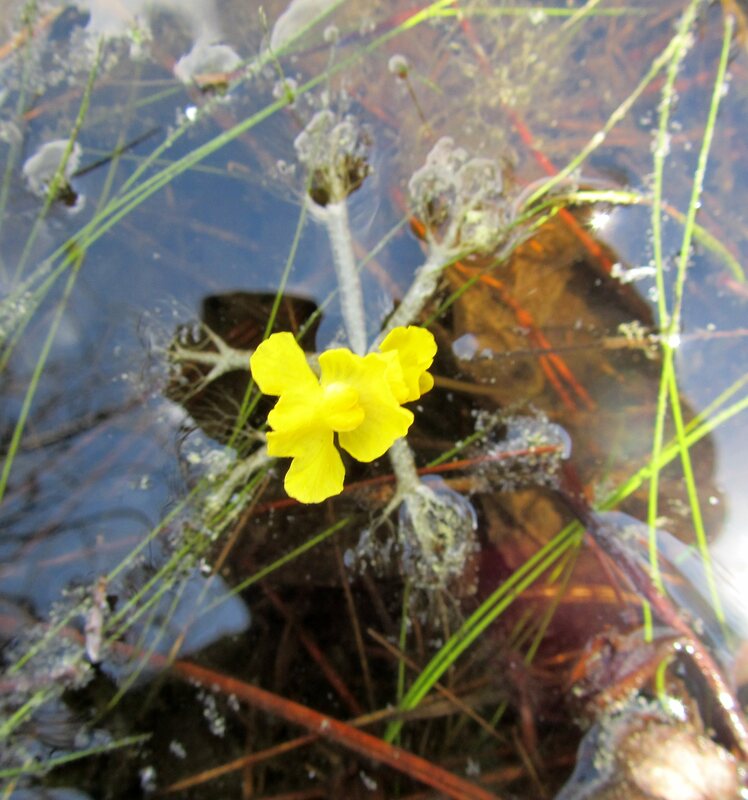 A closer look at the butterworts. 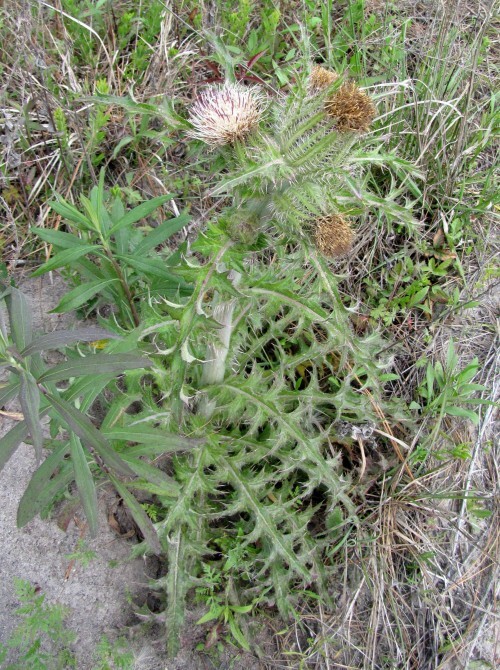 Common Yellow Thistle is a host plant for the small orange butterfly, the Little Metalmark. 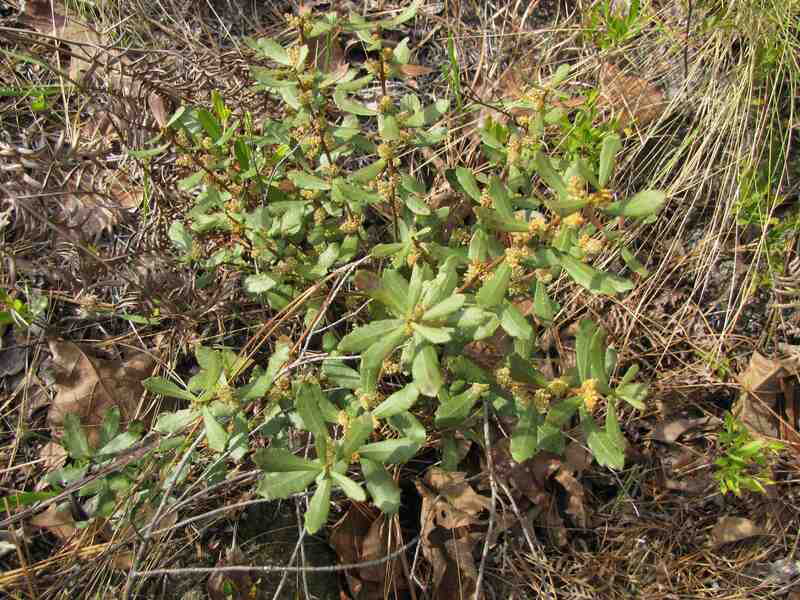 Dwarf Azaleas spread by rhizomes, underground stems, so that large patches form in the right conditions. 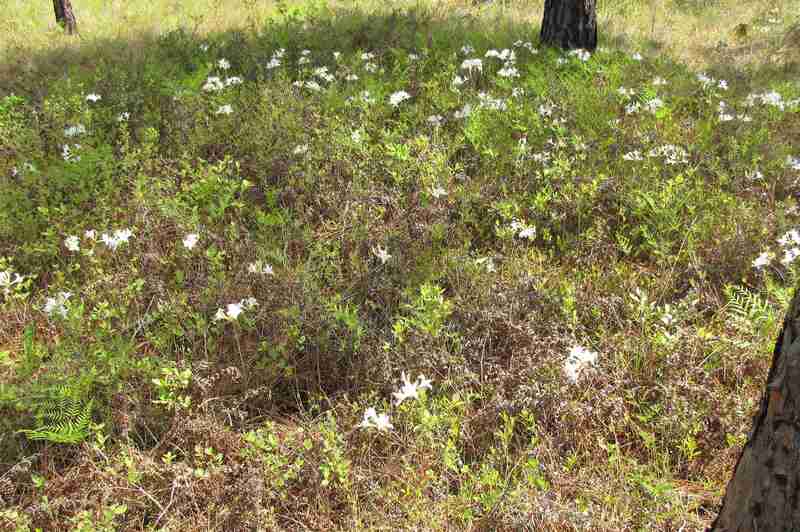 Host to Azalea Sphinx Moths. 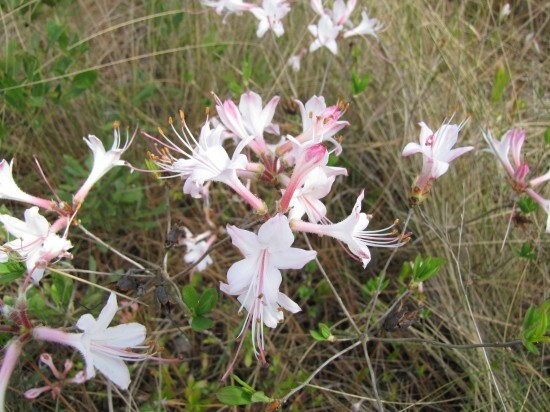 Dwarf Azalea can also have pink flowers. 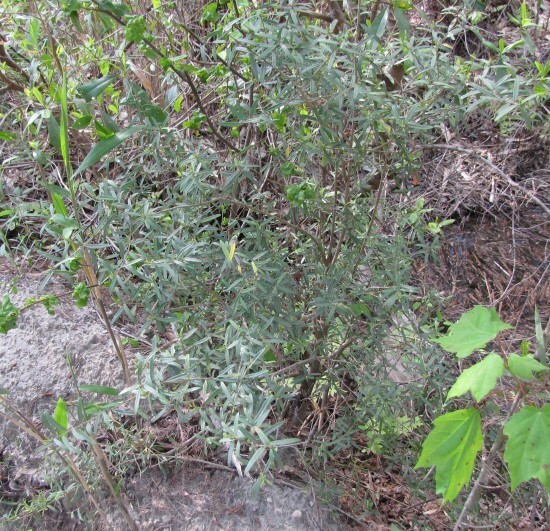 Staggerbush has long, cylindrical flowers in bundles on leafless branches of the previous year. 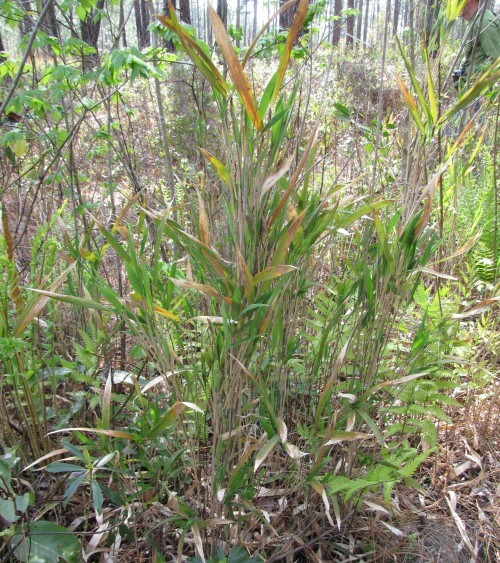 It's a host plants for two species of Datana moths whose showy caterpillars have black-and-yellow stripes and bright red heads. 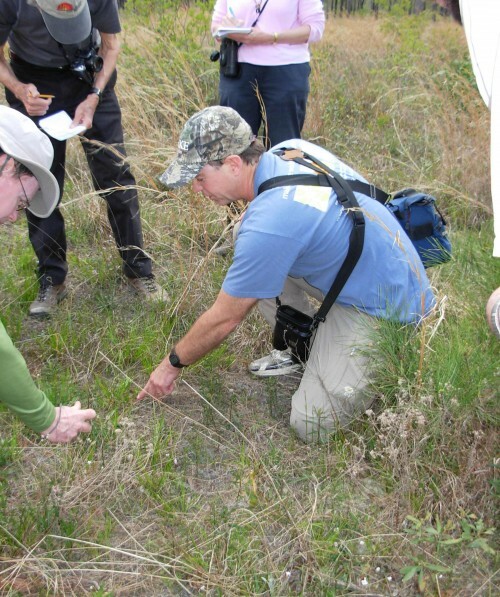 Switch Cane is the host plant for the rare Reversed Roadside-Skipper which Jeff pointed out on the side of the road. 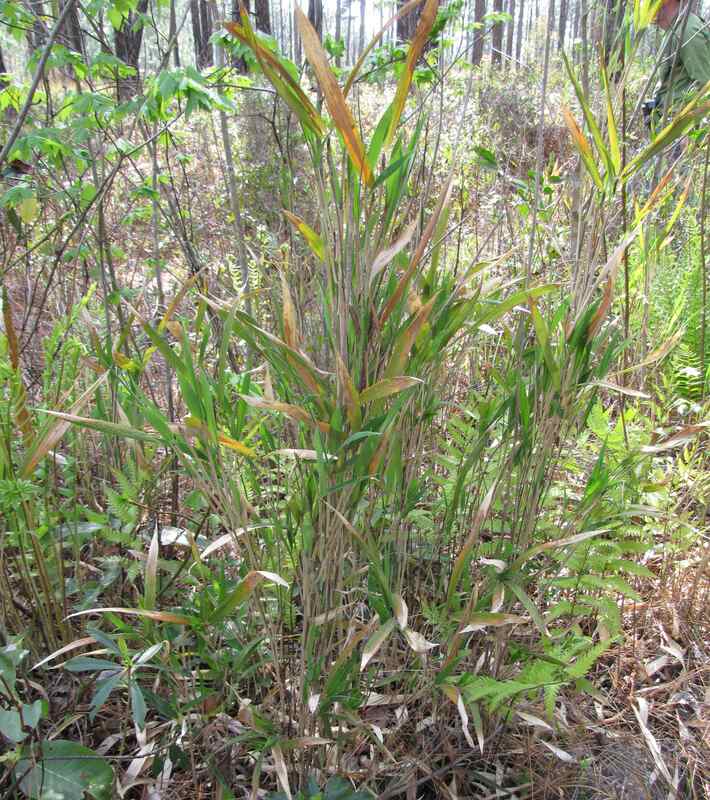 Swamp Bay is the host plant for the beautiful Palamedes Swallowtail which we saw frequently. 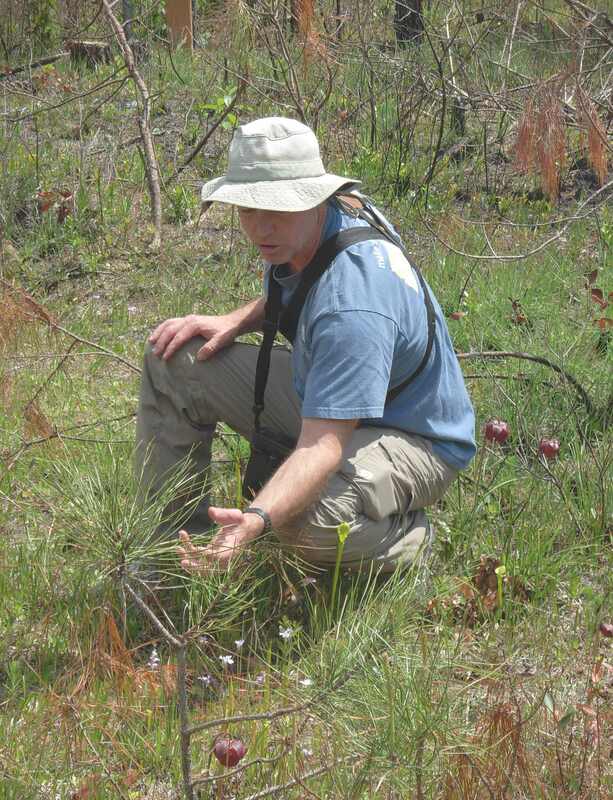 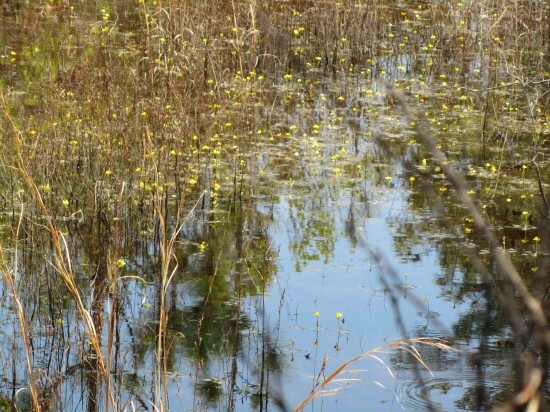 Swamp and Red Bay are being decimated by a fungus carried by an introduced Asian beetle. 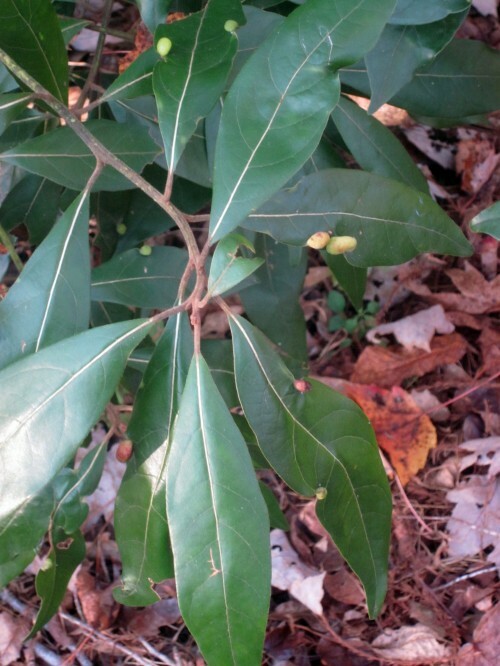 The harmless galls shown on the leaves, along with the bay smell of crushed leaves, are good id marks. Wax-myrtles are host plants for the Little Wife Underwing, a brown moth that shows bright orange bands when it spreads its wings in flight.